The vertebrate, including human, immune system is a complex multilayered system for defending against external and internal threats to the integrity of the body. The system can be divided into two types of defense systems: the innate immune system, which is nonspecific toward a particular kind of pathogen, and the adaptive immune system, which is specific (Figure 12.8). Innate immunity is not caused by an infection or vaccination and depends initially on physical and chemical barriers that work on all pathogens, sometimes called the first line of defense. The second line of defense of the innate system includes chemical signals that produce inflammation and fever responses as well as mobilizing protective cells and other chemical defenses. The adaptive immune system mounts a highly specific response to substances and organisms that do not belong in the body. The adaptive system takes longer to respond and has a memory system that allows it to respond with greater intensity should the body reencounter a pathogen even years later. Figure 12.8 There are two main parts to the vertebrate immune system. The innate immune system, which is made up of physical barriers and internal defenses, responds to all pathogens. The adaptive immune system is highly specific. The first cytokines to be produced encourage inflammation, a localized redness, swelling, heat, and pain. Inflammation is a response to physical trauma, such as a cut or a blow, chemical irritation, and infection by pathogens (viruses, bacteria, or fungi). The chemical signals that trigger an inflammatory response enter the extracellular fluid and cause capillaries to dilate (expand) and capillary walls to become more permeable, or leaky. The serum and other compounds leaking from capillaries cause swelling of the area, which in turn causes pain. Various kinds of white blood cells are attracted to the area of inflammation. The types of white blood cells that arrive at an inflamed site depend on the nature of the injury or infecting pathogen. For example, a neutrophil is an early arriving white blood cell that engulfs and digests pathogens. 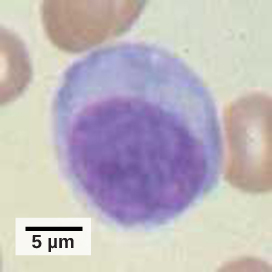 Neutrophils are the most abundant white blood cells of the immune system (Figure 12.9). Macrophages follow neutrophils and take over the phagocytosis function and are involved in the resolution of an inflamed site, cleaning up cell debris and pathogens. 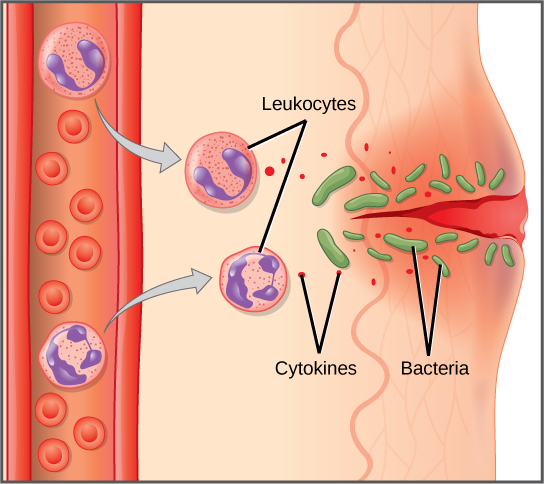 Figure 12.9 White blood cells (leukocytes) release chemicals to stimulate the inflammatory response following a cut in the skin. A lymphocyte is a white blood cell that contains a large nucleus (Figure 12.10). Most lymphocytes are associated with the adaptive immune response, but infected cells are identified and destroyed by natural killer cells, the only lymphocytes of the innate immune system. A natural killer (NK) cell is a lymphocyte that can kill cells infected with viruses (or cancerous cells). NK cells identify intracellular infections, especially from viruses, by the altered expression of major histocompatibility class (MHC) I molecules on the surface of infected cells. MHC class I molecules are proteins on the surfaces of all nucleated cells that provide a sample of the cell’s internal environment at any given time. Unhealthy cells, whether infected or cancerous, display an altered MHC class I complement on their cell surfaces. Figure 12.10. Micrograph shows a round cell with a large nucleus occupying more than half of the cell. After the NK cell detects an infected or tumor cell, it induces programmed cell death, or apoptosis. Phagocytic cells then come along and digest the cell debris left behind. NK cells are constantly patrolling the body and are an effective mechanism for controlling potential infections and preventing cancer progression. The various types of immune cells are shown in Figure 12.11. Figure 12.11 Cells involved in the innate immune response include mast cells, natural killer cells, and white blood cells, such as monocytes, macrophages and neutrophils. Which innate immune system component uses MHC class I molecules directly in its defense strategy? Different MHC class I molecules between donor and recipient cells can lead to rejection of a transplanted organ or tissue. Suggest a reason for this. If the MHC class I molecules expressed on donor cells differ from the MHC class I molecules expressed on recipient cells, NK cells may identify the donor cells as not normal and produce enzymes to induce the donor cells to undergo apoptosis, which would destroy the transplanted organ. The entire complement system would probably be affected even when only a few members were mutated such that they could no longer bind. Because the complement involves the binding of activated proteins in a specific sequence, when one or more proteins in the sequence is absent, the subsequent proteins would be incapable of binding to elicit the complement’s pathogen-destructive effects. 12.2 Innate Immunity Copyright © by laesoph. All Rights Reserved.